The government will exhaust its emergency borrowing authority sometime between March and June 2014, if Congress does not suspend or increase the nation’s debt limit again, according to a new report. The nonpartisan Congressional Budget Office estimated that Treasury’s wiggle room to avoid breaching the debt ceiling could run out as early as March because the government typically runs a large deficit during that month and in February due to tax refunds. Still, April brings in significant tax revenue for the government so that could buy it more time on the debt ceiling, CBO reasoned. 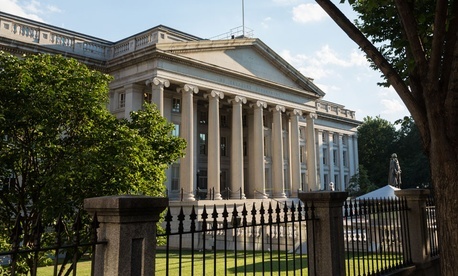 “Given the volume of the government’s daily cash flows and the uncertainty about the magnitude of key transactions during those months, the Treasury could exhaust its extraordinary measures and authority to borrow as early as March or as late as May or June,” the report said. Congress suspended the $16.7 trillion debt ceiling on Oct. 16 – a day before officials estimated the government would have exhausted its emergency borrowing authority. The suspension will last through Feb. 7, 2014. On Feb. 8, the debt limit will be reinstated reflecting the debt issued between Oct. 17 and Feb. 7, increasing the ceiling to roughly $17.3 trillion by then, according to the Bipartisan Policy Center. If lawmakers don’t act on the debt limit before Feb. 8, then the Treasury will employ “extraordinary measures” to keep the government afloat for a bit longer. One of the extraordinary measures that the government often has used to avoid a default is tapping into and suspending investments into the Civil Service Retirement and Disability Fund and halting the daily reinvestment of the Thrift Savings Plan’s government securities (G) fund. The law requires the Treasury secretary to refill the coffers of the G Fund and the Civil Service Retirement Fund once the issue of the debt ceiling is resolved, and in addition, to make up for any interest lost on those investments during the suspension. Treasury made whole the principal investments in the CSRDF and the G Fund on Oct. 17. Interest for both funds is typically restored on the next interest payment date; in the case of the G Fund, that happened on Oct. 18. Interest payments for the CSRDF occur twice a year, so the government will restore the interest accrued on that account on Dec. 31, the next payment date. Tapping into the Civil Service Retirement Disability Fund is “much less valuable” in February and March, the Bipartisan Policy Center said in an analysis, because “there is little debt set to be issued to this fund” during those months. So, the government won’t have as much wiggle room in early 2014 as it did the last time it used extraordinary measures in May 2013.